A big thanks to Armand, who has again sought to lend me a headphone for my honest opinion and, thus, supporting my YouTube channel and written review portfolio. Aesthetically, I have to admit that the EL-8 Open is Audeze’s most stylish headphone to date. While the beefy LCD series can look nice in the right light, they are behemoths designed for sound reproduction first and foremost – with the weight to prove it. The portable SINE is a lot more manageable in terms of build, but its low-key nature makes it look like a generic Bluetooth headphone being used in 2017 rather than something that truly looks like it was made by Audeze themselves – not necessarily a bad thing depending on who you ask. The stylish EL-8 utilizes some wood in its design, but streamlines the rest of the chassis to look more like a consumer-focused and futuristic Audeze headphone. The earpads are made of a soft leather and is smaller than the regular Audeze options. On first impression, they are comfortable enough – but over time I became painfully aware just how little room there was for my ears. I would quite easily touch the driver if I sneezed or shook my head even slightly – and there was an audible dip in the sound from the side that was touched for a split-second. The clamp is also quite high, but not a dealbreaker to me in London’s current weather – but I could definitely see the snug-is-an-understatement fitting becoming a problem as summer comes around. As this is a loaner, I took no measures to try and loosen the clamp out of respect for the unit and its owner – so your mileage may vary if you do so with yours. I’m glad to say that the frame’s connection to the earcups is not a creaky affair with a dubious looking joint – as I saw with the LCD-2. 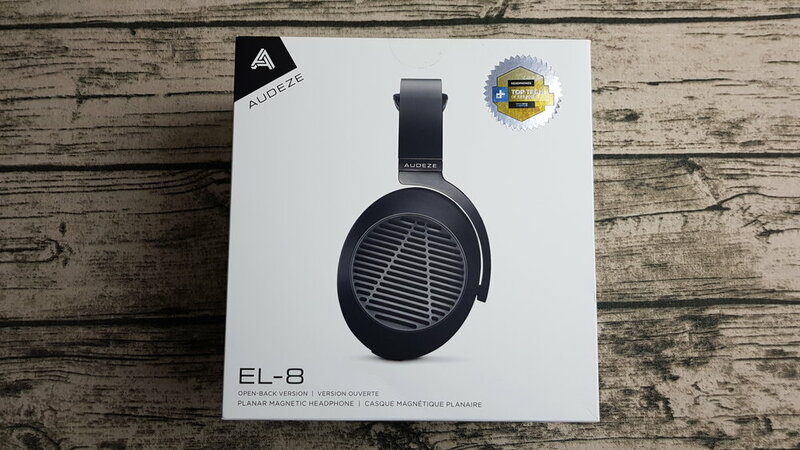 The EL-8 is actually quite a sturdy and well-built headphone in terms of strength – and it has the weight to prove it, around 460g. I can’t say that I’m a fan of the cable, a tapeworm-looking flat cable with connectors that look more suitable for connecting a hard drive to a motherboard than a cable to a headphone. 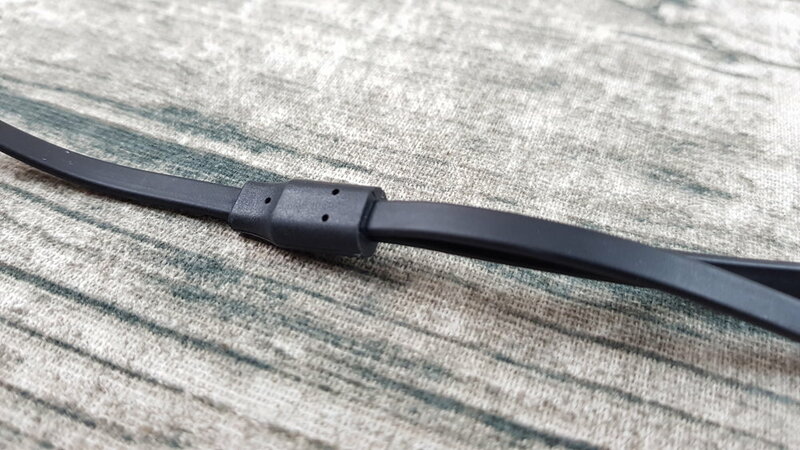 I do see that the standard 4pin XLR Audeze connectors would have been too thick for this more stylish headphone, so they took measures as they saw fit – and I can’t fault them for that. I can’t pick holes in how it works, it doesn’t fall out randomly and stays in place quite well – it just looks weird to me but that is a highly subjective opinion. In an upgrade over the LCD-2, the top of the EL-8 has a floating pad that helps with the weight distribution of this headphone. The surface area of the pad is quite small however. I learned long ago that an open-aire headphone did not necessarily mean a wide and expansive soundstage, examples which include everything from the Hifiman HE-400i to the Focal Utopia – but I was taken aback by just how narrow the EL-8 felt. An intimate soundstage, in an open headphone, does not bother me so much when there is a depth to the imaging, but the EL-8 faltered on this front. The instruments are up close and have a “boxed in” effect to them. The bass in the EL-8, while present, was quite muted – not at all what I was expecting. I would not call the LCD-2 (2016) an especially bassy headphone, but it had some body to the low end that had some pleasing texture as well. What the EL-8 has instead is a sense of the bass existing, but it is very imprecise in nature – bordering on being overly rounded and smoothed instead of textured. I hear this a lot with bass guitar work, and kick drums lack impact or punch to them. That is quite indicative of the sound of the EL-8 overall actually, it does not have much punch or slam – any dynamics are muted. While the LCD-2 is a laid back headphone, it does not feel too lacking in resolve or accuracy of impact. Sure, they are softer than they would be on headphones and speaker systems that emphasize this – but the EL-8 hits like a pillow by comparison. The lower midrange of the EL-8 is actually quite well represented, and the tonality of several instrument tracks (such as acoustic guitar strumming) and male vocals are quite well served. A listen to the original acoustic version of Simon & Garfunkel’s The Sound of Silence confirmed this to me, with both voices gliding melodiously and quite clearly – with the body they required. The lower mid emphasis is also not overwhelming, and I rarely come across a recording which feels bogged down due to any sense of bass-to-lower-midrange bleed. On the subject of tonality, the EL-8 did quite well with some classic rock genres that can feel problematic on some bloomer headphones – with even the Beatles’ oldest recordings sounding clear and with the correct amount of weight behind the vocals and instruments. The midrange itself, the area where this headphone is focused overall to my ears, is also well done. To the headphone’s credit, instrument separation is decent in its narrow soundstage – with problematic overlap being avoided in most genres. The midrange definitely has the warm tilt of the lower midrange, with the upper midrange feeling quite dipped in comparison – for which female vocals and stringed instruments may suffer. There is a veil around the sound of this headphone that I am not a fan of. I can’t just blame a rolled off treble and be done with it, as it seems to go beyond that. Even in modern genres of music that are generally more slickly produced, and mixed quite brightly compared to warmer and more analogue recordings of yesteryear – the EL-8 manages to sound like I’m listening to the music behind a thin sheet of glass – and it is something I can’t defend in the slightest. The treble, while being rolled off as it is, still manages to pick certain instruments (usually cymbals) to ring out clearer than others – but as an overall effort, the headphone is veiled and too soft. The LCD-2 was also a laid back and soft effort by Audeze, but one that had far more of a “hi-fi” sound to it than the EL-8. I dislike using that term in this context, but I can’t think of another way to put it. If you want to spend this kind of money on a headphone, and like the Audeze sound signature, you should be looking at the 2016 LCD-2 over this in every situation other than you needing something that can be driven decently by a smartphone. The LCD-2 provides a warm, laid back sound that is tonally rich in the midrange and isn’t nearly as veiled. The soundstage is wider, the impact is a little more present and the details are a little more resolving. If you can look past the weight, the uncomfortable fit (without the Lohb or Audeze carbon fibre strap) and the difficulty in amping (relegated to a desk setup for most) – the LCD-2 should be what you opt for over the 30% cheaper EL-8. Hell, you could even pick up a b-stock LCD-2 on Black Friday for the same price as an EL-8 – or even cheaper. Overall, I found the sound of the EL-8 a very mixed bag. On one hand, I am impressed by just how well it can do with male vocals and older recordings – along with a semblance of instrument separation. On the other hand, I dislike how soft its impact is, how veiled the overall sound is and how it’s a big downgrade over the superior LCD-2 which is not usually that much more in price. As the marketing states, this headphone is very sensitive and can be driven by a smartphone. On both my Samsung Galaxy S6 and S8, the full volume setting was quite loud – for my preferences. While I did run this from my Audio-GD NFB-28 as well, I did not hear much benefit to the sound overall. Any benefit that I did hear came from the introduction of a superior DAC to the mix, which is the same improvement over the smartphones that I heard by using my Ibasso DX80 or Aune M1s digital-audio players. I find it very hard to recommend this headphone over Audeze’s own LCD-2 to most people – if they insist on the house sound. While heavier and harder to drive, the LCD line introduction is a far superior headphone to the EL-8 on a purely sound quality basis – which matters to me over anything else in this hobby. If you are looking for an Audeze offering that is smaller than the LCD series, I would recommend the SINE over this as well.